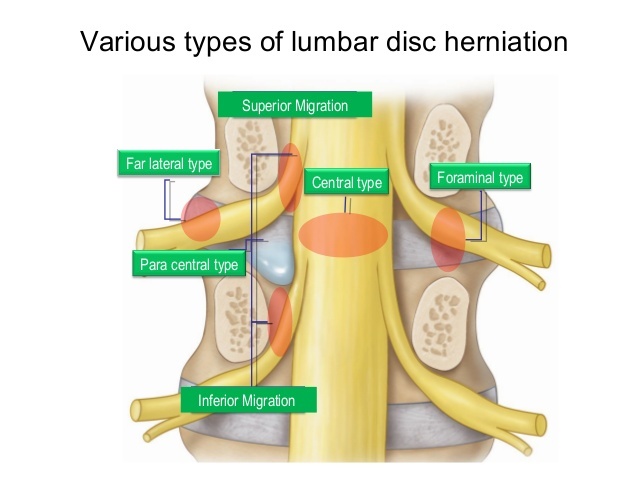 Based on a review of the published literature, the most commonly used and studied classification systems for lumbar disc herniation include the Combined Task Force Classification (CTF) and Jensen systems 1). Associated with back pain is often related to disc degeneration. The most commonly used and studied classification system for lumbar nerve root compression includes proposed nomenclature by Pfirrmann grading system and van Rijn. After pooling the interobserver agreement of various nomenclature systems, there is level 1 and 2 evidence to suggest that the CTF classification of lumbar disc disease has significant interobserver agreement and van Rijn et al.’s criteria of lumbar nerve root compression has significant interobserver agreement. These nomenclature systems are the most reliable for describing lumbar disc/nerve root pathology. The Combined Task Force (CTF) and van Rijn classification systems are the most reliable methods for describing lumbar disc herniation and nerve root compression, respectively. van Rijn dichotomized nerve roots from “definitely no root compression, possibly no root compression, indeterminate root compression, possible root compression, and definite root compression” into no root compression (first three categories) and root compression (last two categories). The CTF classification defines lumbar discs as normal, focal protrusion, broad-based protrusion, or extrusion. The CTF classification system excludes “disc bulges,” which is a source of confusion and disagreement among many practitioners. This potentially accounts for its improved reliability compared with other proposed nomenclature systems 2). Jensen MC, Brant-Zawadzki MN, Obuchowski N, Modic MT, Malkasian D, Ross JS. Magnetic resonance imaging of the lumbar spine in people without back pain. N Engl J Med. 1994 Jul 14;331(2):69-73. PubMed PMID: 8208267. Li Y, Fredrickson V, Resnick DK. How should we grade lumbar disc herniation and nerve root compression? A systematic review. Clin Orthop Relat Res. 2015 Jun;473(6):1896-902. doi: 10.1007/s11999-014-3674-y. Review. PubMed PMID: 24825130; PubMed Central PMCID: PMC4418997.